We have a nice variety of livestock pen system trailers for show pigs, sheep, and goats! Great prices, great service, and lots of inventory on hand! From 12' long Frontier bumper pull 4 pen stock trailers to 28' Frontier aluminum gooseneck 10 pen stock trailers. 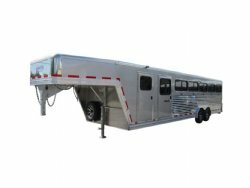 We have the trailer you need or we will order out a custom pen system trailer for you. We have used show pig trailers for sale sometimes. All our new pen system trailers can be configured as 50/50 or 60/40 pen configurations. We can do watering systems, 110 volt packages, generator preps and installs, fold down beds in the dressing room, etc. Call us at 618-242-0800 and let our experience work for you!